Very nice resort in the heart of Seminyak with wonderful friendly staff. Large choice of places to eat nearby. 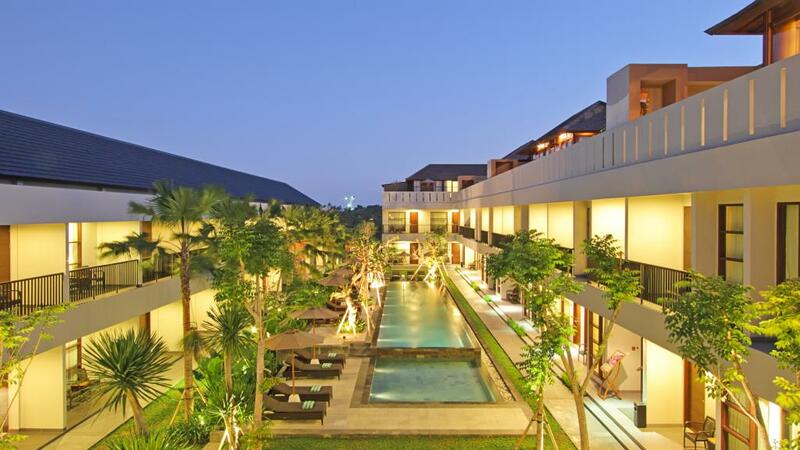 This is a very quiet, peaceful resort despite its central location in busy Seminyak. Excellent. Good accommodation. Great staff. Excellent resort with a range of accommodation to suit everyone. Staff were magnificent, friendly, helpful nothing was too much trouble. Our stay here was perfect, the staff are amazing. The rooms are spacious and very clean, the pool is refreshing. Treat yourself and have a spa treatment with Saka he is very talented. The restaurant is so so but eat street has so many great restaurants that you only have a 100mtr walk to find an amazing restaurant. Nice spot, but poor breakfast/food on site. Our room wasn't ready on time so we were upgraded to a slightly bigger ground floor room overlooking the pool - nice. The resort was well kept, the staff mostly very friendly (especially the room service staff) but the supplied breakfasts were mediocre at best - we skipped breakfast here for 3 days and ate elsewhere; everyone we spoke to also told us that the lunches and dinners they tried at the Bistro were also very ordinary.